This is probably my favorite part of the iPhone, but probably not the best feature of the iPhone. While I don’t have any experience with other phones, I can say for my needs, the iPhone functions just fine. Before, I didn’t have mobile access to my email, now I do. That boils down the basic reason why I like the email on the iPhone. I only use my Gmail account (the only other email account I use is my work email), but I find that I use a combination of the built in application to read and respond to emails and the Gmail mobile interface in Safari to manage and archive emails. This provides the best solution giving me email alerts every 15 minutes through the built in application but an enhanced interface when I need it via the web. 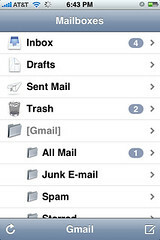 Using Gmail and IMAP I have a single place to manage all of my email. Any change made on the web interface, my iPhone, or Outlook all are synchronized making it easy to move between the various interfaces. I must admit that it is a disappointment there is no built in RSS reader provided by Apple. While there are some RSS readers available in the application store, with even a few of them being free. 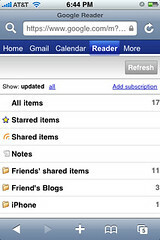 Even if there was an RSS application, I would likely not use it because of my addiction to Google Reader. I’ve been extremely loyal to Google Reader since I started using it and have spent an extensive amount of time customizing all of my RSS feeds. The Google interface in the web browser provides a very fluid interface. It manages to function about the same quality as many of the dedicated applications. The Google Reader interface relies entirely on AJAX making it very responsive, but quirky at times. I find myself taking the few free minutes I have throughout the day reading the news that appears in my Google Reader. This really saves time in the long run because I can read a few stories at a time throughout the day and not just in one long sitting. When this application was first released many people complained about it not being very stable and was basically unusable. However, a new version was released by the time I even purchased my iPhone so I’ve had an overwhelmingly positive experience with it. I have found that it has caused my to stat using Facebook a little more. While there are some glaring features missing, like the ability to add new friends and accept friend requests, it covers the basic functionality required to use Facebook. As an added bonus, in playing with the built in chat client, it works perfectly with the only drawback being it only can get alerts when the application is open. The best feature is the picture integration. I have disabled Facebook mobile because it no longer is necessary. 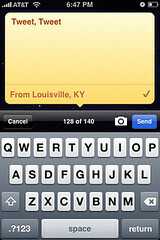 I receive alerts via email and can access and respond to messages and wall posts via the interface. I would be thrilled to move to some other Twitter client, but nothing is quite as elegant. The built in location information is nice, but it is tied to Twinkle and not Twitter. Also, it crashes at least once every day. The interface displaying the tweets is far better than the other ones I’ve played with. However, I will probably move away from this application if something else presents itself. While the Facebook application (along with email alerts) have caused me to deactivate Facebook text messages, I still have selected tweets sent to me as text messages. 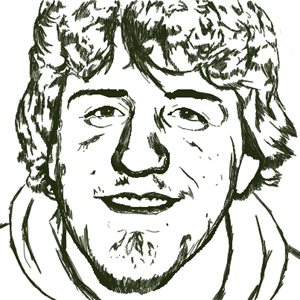 Again, this could be solved with background process. However, I really hope this problem is solved when Apple releases their push ability for developers. 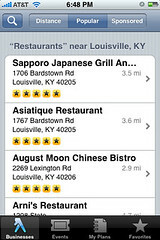 I’ve tried a wide variety of applications to identify restaurants and other business near my current location. While I haven’t found one that stands out, my favorite is YBmobile. This application can perform a simple location based search. The results always include an address and phone number and sometimes a web address and some other useful information. My close second place is Google and their combination of the creatively named Google application and the built in Google Maps application. I’ve had mixed results with this because it doesn’t present the information perfectly. It produces useful results, but it doesn’t have the best interface to go through them. However, when getting directions to a place via YBmobile it automatically opens Google Maps so I end up using Google Maps in the end no matter what. On a random side rant, I still need to use my TomTom to get actual turn by turn directions when navigating to anywhere. Shazam and midomi are amazing applications that do almost the exact same thing. 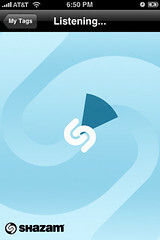 When just listening to a song that you want to identify, Shazam is by far the better of the two application. My success rate with Shazam is almost perfect. Midomi seems to miss even obvious songs when Shazam has no problem. However, midomi provides additional functionality by allowing you to say the name of a song or hum or sing a song. Shazam’s interface is very simple, but midomi provides far more functionality. The best feature of tagging a song is the ability to play the YouTube video. While they both allow this, I feel that midomi has a little advantage in this category. This category of applications is still in its infancy and I am excited to see how these evolve. So far I’ve been satisfied with my iPhone, but I would have not been able to stand the first generation iPhone. The application store, GPS, and high speed connection (3G) makes the device a replacement for a laptop for quick trips to the Internet. 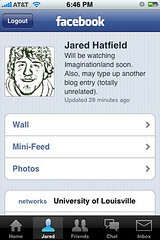 While I’ve been a little heavy on the iPhone blogging the past two days, I still haven’t mentioned some of the other applications (mainly games) that I have used on my iPhone. Overall having an iPhone has changed my Internet habits and having access to search no matter where I am will prove useful in situations I’ve yet to be in. Overall, there are a large number of benefits to the iPhone and I have no regrets, yet, in my purchasing decision. While the iPhone was meant to be a phone with an iPod built in, I have yet to use any of the iPod functionality. For me the iPhone serves as a communication device that has an amazing portable web browsing experience.